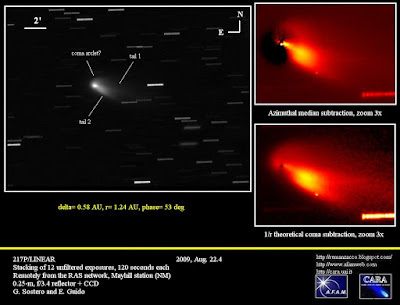 IAU Circular nr.9067, issued on 2009, Aug. 29, announces the discovery of a new comet by R. E. Hill, named P/2009 Q1 (HILL). It was found on Aug. 27 in the course of the Catalina Sky Survey with a 0.68-m Schmidt telescope. 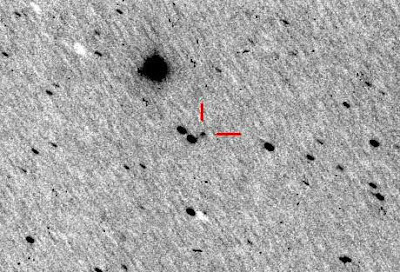 After posting on the Minor Planet Center's 'NEOCP' webpage, the object's cometary appearance has been noted by several observers. We have been able to confirm this object remotely, through the GRAS network, using a scope located in Mayhill (NM): on 2009, August 28.3, co-adding of 15 unfiltered exposures, 120 seconds each, obtained by means of a 0.25-m, f/3.4 reflector + CCD, shown a diffuse coma almost 15 arcmin in diameter and a broad tail 50" long in p.a. 255. The total magnitude m1 has been established to be about 18 (unfiltered CCD). 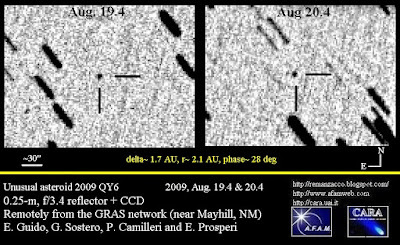 The first orbit indicates for comet P/2009 Q1 (HILL) a perihelion on July 19, 2009, at about 2.8 AU. Prompted by an alert note posted today by David Cardeñosa on [Comets-ml] about the unusual aspect of 217P/LINEAR he recorded in his images of this comet obtained on 2009, Aug 22.1, we performed some follow-up about 217P remotely, through a 0-25-m, f/3.4 reflector + CCD (near Mayhill, NM). Co-adding of 12 unfiltered exposures, 120 seconds each, obtained on 2009, Aug. 22.4, confirms the presence of a highly structured coma. The central condensation appears sharp, and elongated in a West-East direction. A spiralling arclet about 1.5 arcmin long is emanating from the central condensation in clockwise direction. We notice the presence of two distinct tails: one about 1.8 arcmin long in PA 245 deg, and a second one, about 2 arcmin long in PA 236 deg. Our Team recovered this comet on March 2009. M.P.E.C. 2009-Q32 , issued on 2009 Aug. 20, announces the discovery of an intriguing object: 2009 QY6. It was picked-up on Aug. 17 with the 1.0-m f/2.15 reflector + CCD of the Lincoln Laboratory ETS team (NM), while it was moving at about 1.2"/min in the morning sky, through the constellation of Aries. This object has an extremely peculiar orbit (a= 7.35 AU, e= 0.72, i= 137 deg, P= 20.0 years, as for 2009, Aug. 21 MPC website), very similar to that of a comet. We performed some follow-up of 2009 QY6 while it was still listed in the NEO-CP website (labelled as "BP85104") from the Castelmartini Obs (MPC#160) on 2009, Aug. 19.0, and from the RAS Observatory (MPC#H06) on Aug. 19.4 and 20.4. In all our stacks, we were consistently unable to identify any cometary feature on this object. Down to the limit of our seeing condition, we always obtained a FWHM profile of 2009 QY6 that was virtually undistinguishible compared to that of nearby field stars having similar brightness. According to its preliminary orbit, this curious object might well be a "Damocloid", a few kilometers in diameter. It will reach its perihelion on 2009, OCt. 1, at about 2 AU from the Sun, and it's well worth to keep 2009 QY6 under close scrutiny, in order to check any arise of residual degassing. CBET nr.1913, issued on 2009, Aug. 18, announces our recovery of P/2002 S1 = P/2009 L18 (SKIFF). Our quest for this faint (magnitude about 20 at the time of recovery) periodic comet, started about two months ago, when we had several attempts to locate it in the southern costellation of Indus, by means of the remotely-controlled Skylive-Grove Creek main telescope (a 0.35-m, reflector + CCD located near Trunkey, NSW, Australia). 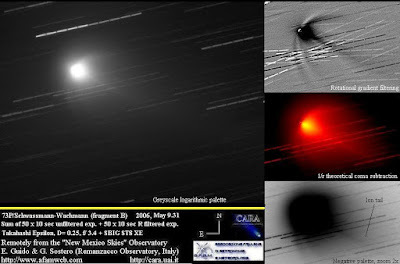 Finally we found it on 2009, June 15.6, about 1.7 arcmin northeast of the ephemerids position, and nearly 1.3 magnitudes fainter than predicted. We performed a second night of follow-up on Jun. 17.6, however at that time the comet was projected over a field star, so we couldn't find it. Afterwards we had a row of bad weather, moonlight interference, personal problems, ect, that prevented us to perform a second night of astrometry, until Aug. 18.6, when we successfully imaged again P/2002 S1 through the same instrumentation. At that time the comet was about 1.8 arcmin northeast of ephemerids, nearly 1.5 magnitudes than predicted. On both observing runs, we found the comet of starlike aspect, without any appreciable coma and/or tail. According to CBET nr.1913, this object will reach its perihelion (q~ 2.4 AU) on 2010, Aug. 15. The ephemerids generated at the Minor Planet Center website inform us that P/2009 L18 (SKIFF) will reach its maximum brightness at perigee, on the beginning of next November 2010 (about magnitude 17). Its last astrometric report before our recovery was performed on 2003 Apr. 07.89 by Peter Birtwhistle, from the Great Shefford Observatory (MPC#J95). 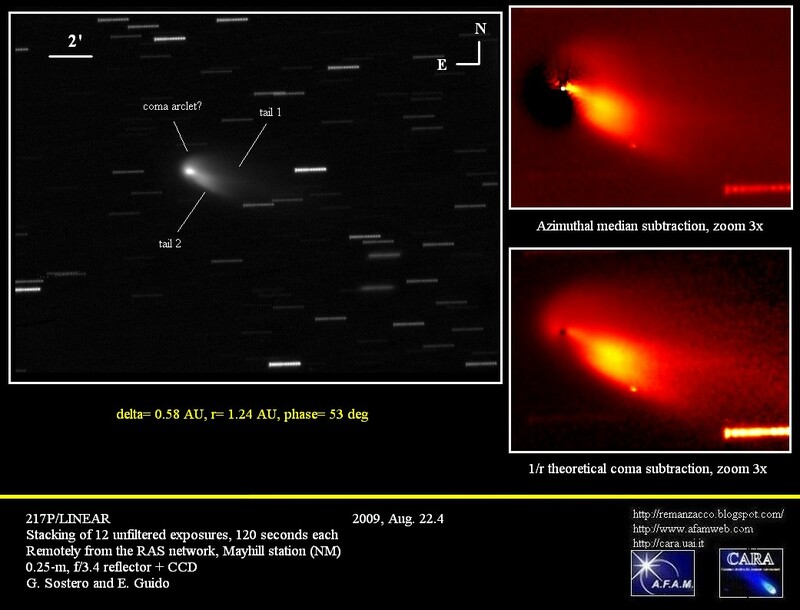 IAU Circular nr.9063, issued on 2009, Aug. 18, announces the discovery of a new comet by Andrea Boattini, named C/2009 P2 (BOATTINI). 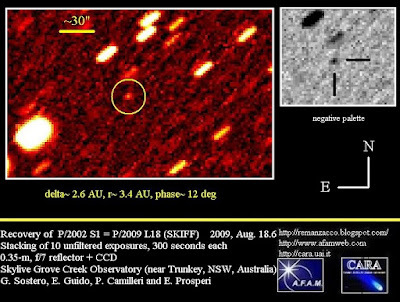 It was found in the within Pegasus, with the 0.68-m schmidt of the "Catalina Sky Survey" on 2008, Aug 15.4. 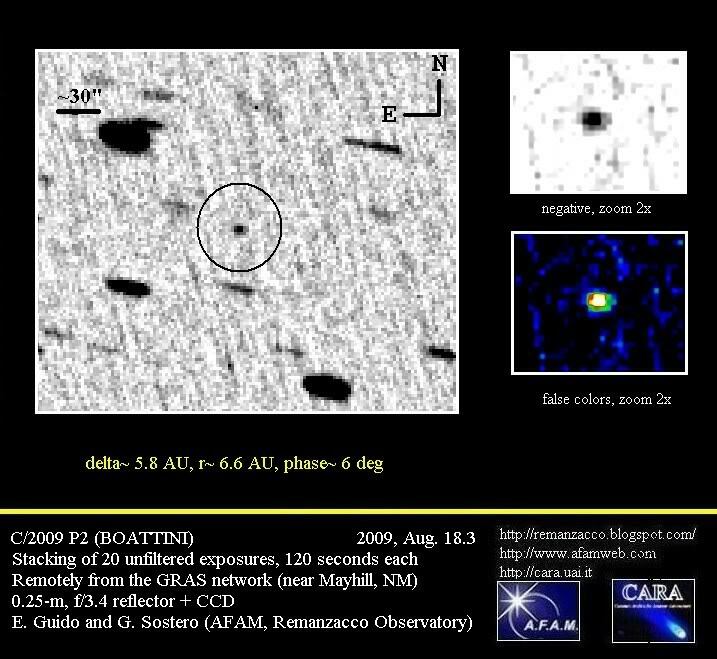 Afterwards this object has been posted on the NEO-CP with the ID code of "9P1083D", in search of follow-up observations. Then, several astrometrists provided positive feedbacks about its cometary nature. We first picked up this object on 2009, Aug. 17.4 remotely, from the Mayhill (NM) station of the Global Rent a Scope network. Unfortunately, of the 10 unfiltered exposures, 120-sec each we obtained through a 0.25-m, f/3.4 reflector + CCD, only a few were usable, because the object was merging with a field star. Under those circumstances, we could only obtain an astrometric position, with no clues about its nature because in our stacking we had not enough signal/noise to discriminate if it was an asteroid or a little comet. We were more lucky on Aug. 18.3, when we were able to secure 20 unfiltered exposures, 120-sec each, by means of the same instrumentation. After careful image processing, it was clear to us that the object was not showing a stellar aspect: comparison of its FWHM profile with that of nearby field stars, was consistently showing higher values; the reason of this difference was the presence of a tiny coma, about 8 arcsec in diameter, with a slight elongation toward south-west. according to the data published so far by the Minor Planet Center, this object is moving along a parabolic (e=1), retrograde (i= 164 deg) orbit, with a perihelion at about 6 AU, that will be reached in July 2010. At about that time, it will reach a maximum magnitude of m1 about 17.4. Cbet No. 1910 issued on 2009, August 17th announces the discovery by Koichi Itagaki of a possible nova (mag 10.0) on his unfiltered CCD survey frames taken on Aug. 16.515 UT using a 0.21-m f/3 reflector. Nova Ophiuchi 2009 has been confirmed spectroscopically by various observers with the BAO 1.01-m telescope on Aug. 17.6 UT, in the course of the BAO Summer School and Japan Space Forum. U. Munari et al. reports on Cbet No. 1912 that medium-resolution CCD spectrogram (0.06 nm/pixel; range 540-670 nm) was obtained on Aug. 17.83 UT with the 1.22-m telescope of the Asiago Astrophysical Observatory showing a quite-red spectral energy distribution and the very wide profiles of the emission lines. "The colors, the rapid decline, and the velocity of the ejecta suggest that N Oph 2009 is a highly reddened outburst occourring on a massive white dwarf, not dissimilar from the U-Sco type of recurrent novae. A search in plate archives for missed previous outbursts could pay dividends". "Discovery of a Second Nova Eruption of V2487 Ophiuchi"
Cbet No. 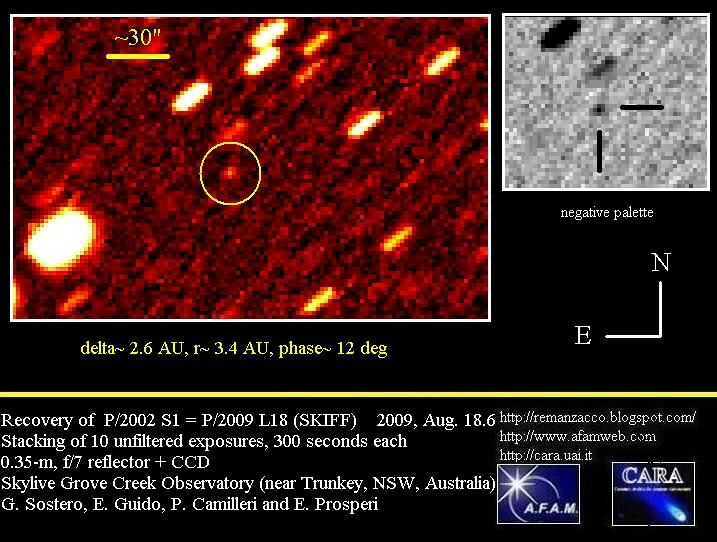 1908 issued on 2009, August 15th announces the discovery by G. J. Garradd of a new comet: COMET C/2009 P1 (GARRADD). The discoverer describes this comet as a tailless object with an approximately circular coma 15". According to the first and very preliminary orbit, comet C/2009 P1 (Garradd) has perihelion on Aug. 10, 2011, at about 1.3 AU. 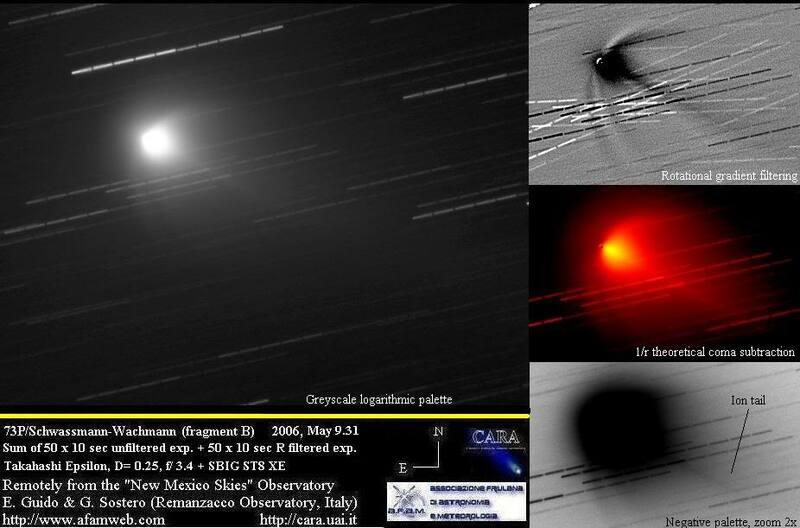 If this preliminary parabolic orbit will be confirmed, this comet may reach at least 8 magnitude in the summer of 2011. Cbet No. 1899 issued on 2009, August 07th announces the discovery by K. Nishiyama and F. Kabashima of a possible nova (magnitude at discovery 7.7) in Sagittarius on two 60-s frames on Aug. 6.494 and 6.495 UT using 105-mm f/4 lens + unfiltered CCD. Independently the same nova has been discovered by All Sky Automated Survey (ASAS) with a telephoto lens 200/2.8, diameter 70 mm + CCD + Johnson V filter. 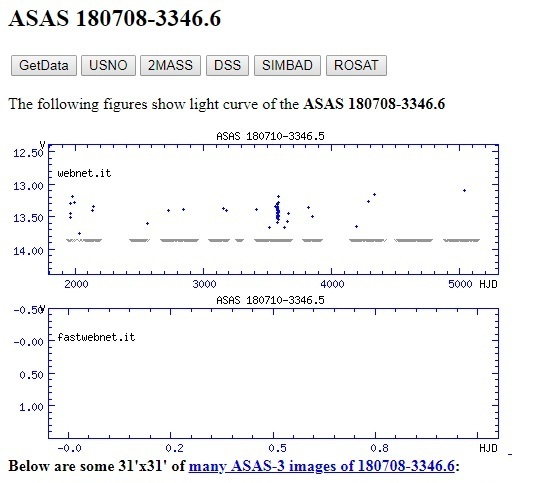 G. Pojmanski, D. Szczygiel and B. Pilecki of Warsaw University Astronomical Observatory reported ASAS discovery on vsnet-alert 11369. According to ASAS images, the new object was V=7.78 on August 06, 2009. Nova Sagittarii 2009 no. 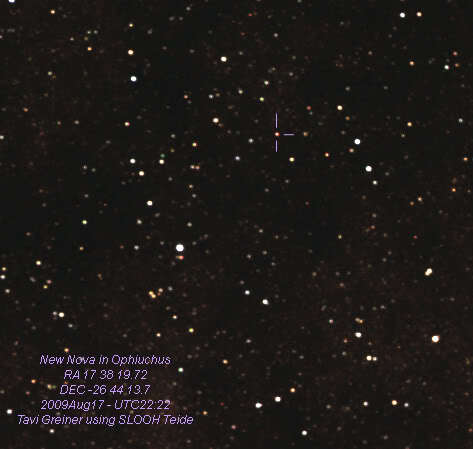 3 has been confirmed spectroscopically as a nova by M. Fujii (Fujii Bisei Observatory, Okayama, Japan). The object shows Balmer series emission lines and Fe II emission lines. The FWHM of Halpha emission is 2300km/sec. Preliminary orbital elements from the Minor Planet Center assumes its orbit as parabolic, with an inclination of 108-deg. Perihelion will be reached on Mar. 24, 2010, at r about 0.70 AU from the Sun. This comet is expected to reach a maximum magnitude of about 9, at its perihelion. We have been able to confirm this object while it was posted in the NEO-CP, both from mpc code H06 & 160. Co-adding of 6 unfiltered exposure, 120 seconds each, obtained remotely near Mayhill (NM) on 2009, July 30.4 through a 0.25-m, f/3.4 reflector + CCD showes that this object to be a comet with a small, compact, coma nearly 5 arcsec in diameter with a tail 30 arcsec long in PA 225 image. Preliminary orbital elements from the Minor Planet Center assumes its orbit as parabolic and indicates perihelion already on Apr. 21, 2009, at about 1.9 AU. Preliminary orbital elements from the Minor Planet Center assumes its orbit as parabolic and indicates perihelion on Dec. 1, 2009, at about 2.9 AU. All 3 comets have been found in the course of the Catalina Sky Survey. According to COCD website now the total of comet discoveries is 73 for Catalina and 15 for Hill.